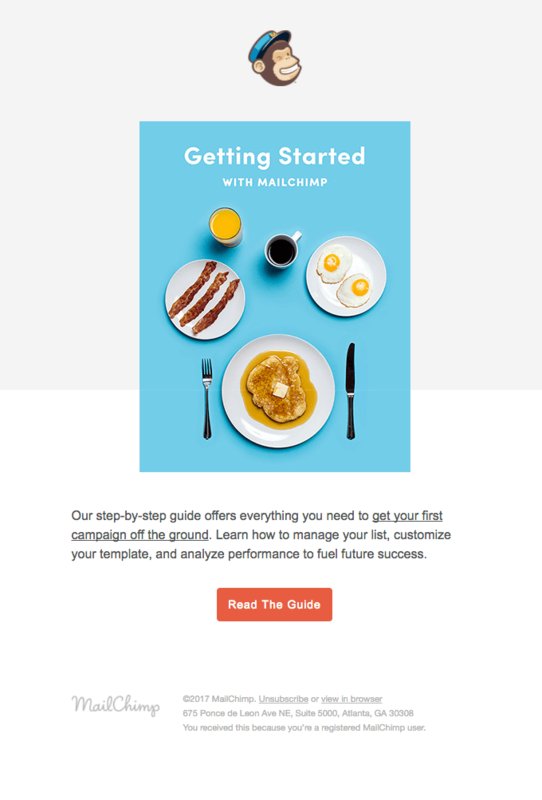 Well-designed onboarding emails can guide new customers in the right direction and set the tone for their experience with your company. 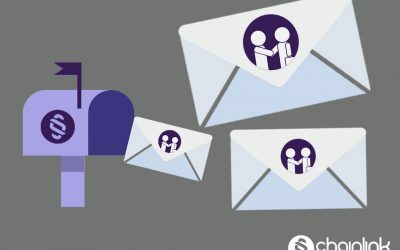 The importance of getting off on the right foot with your email communications is critical in this competitive digital era. 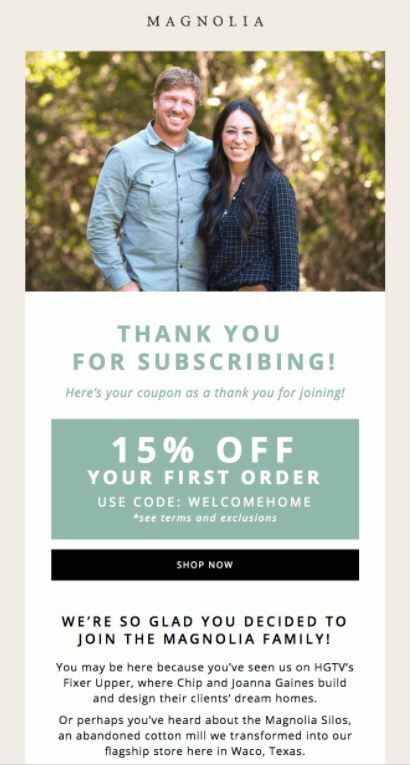 Regardless of your familiarity with Chip and Joanna Gaines and their home building/renovation show and online marketplace, this email welcomes you with a simple, effortless design and an inviting call to action (CTA). The discount front and center is a smart move. Also, the copywriting is on-point: “We’re so glad you decided to join the family” is the perfect warm welcome that Magnolia’s target audience wants to hear. 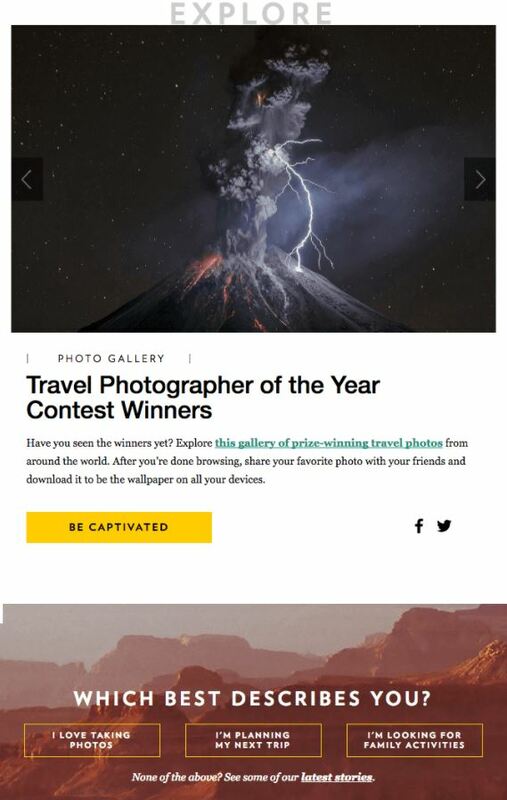 National Geographic is another company that proves it knows its audience well. The focus on exploration and adventure and stunning imagery is perfectly on-brand. 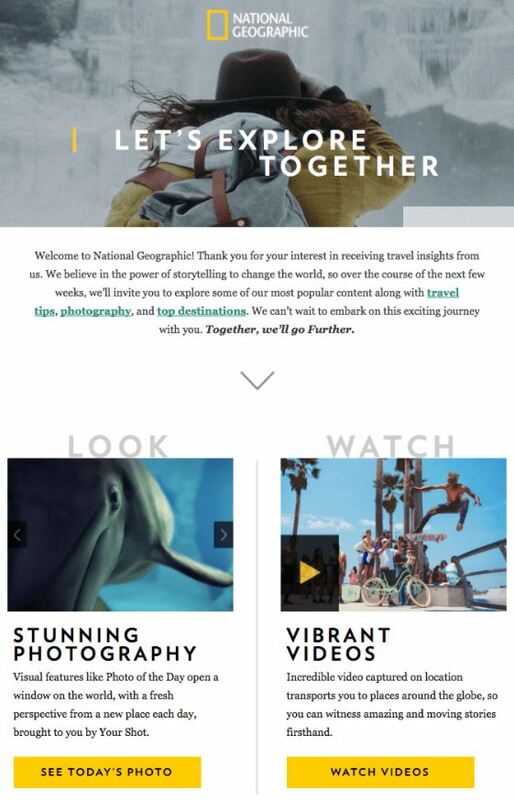 The 3 CTA’s to “Look”, “Watch” or “Explore” drive recipients to Nat Geo’s website. 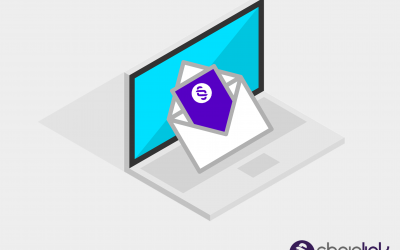 They also expertly include a question at the end of the email to help further personalize the subscriber’s experience. The same way that Magnolia offered an enticing discount, ban.do rewards new subscribers with a special deal. The large, colorful text and imagery is aligned with the rest of ban.do’s brand image, and they skillfully include social media buttons as a clear micro-CTA. 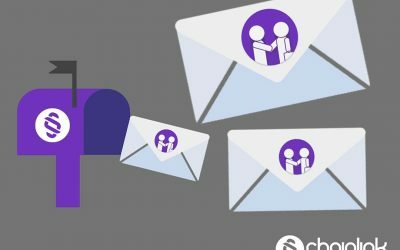 By setting the stage for easy communication in this first onboarding email, Bespoke Post sets itself up for a great relationship with its subscribers. People love to know exactly how things work and what to expect. Subscribers will also love how clearly the company states its customization capabilities. I also think its enviable how the email doesn’t shy away from reminding recipients that they can cancel their subscription at any time. The highlight of this welcome email is the “We think you’ll love” section, complete with enticing images of one of Lush’s signature products. Another great part of this email is the inclusion of the social media buttons and the invitation to “join the conversation” and engage with them. Also, the video was clever to include, because when you click on it, it brings you straight to a landing page that plays the video (automatically driving traffic to Lush’s site). This email is classic and streamlined. 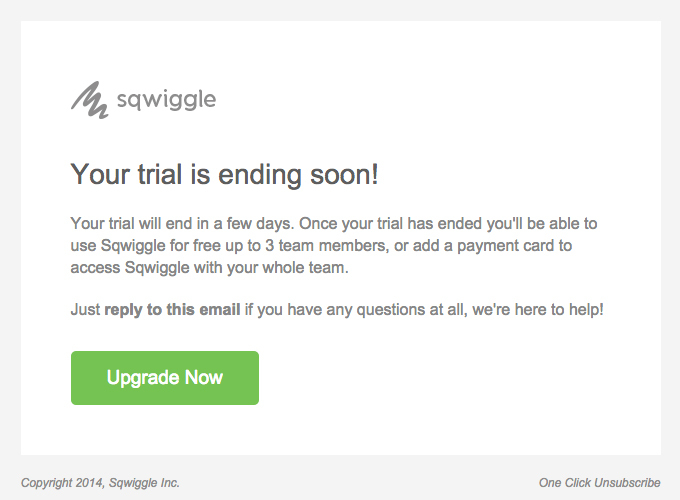 It has the appropriate CTAs without sounding pushy (which is never a good idea with an onboarding email, especially). It also clearly spells out the three perks of being a member. “Getting Started” emails are all about the subscriber taking action. Don’t freak out your subscribers. Use the getting started email to get new folks to take a single step. MailChimp is very straightforward but effective. The bright, simple imagery is engaging and to the point. The button links to the guide that people need to follow to finish getting started, which is great. Simplicity is sometimes the best possible way to have your voice heard. 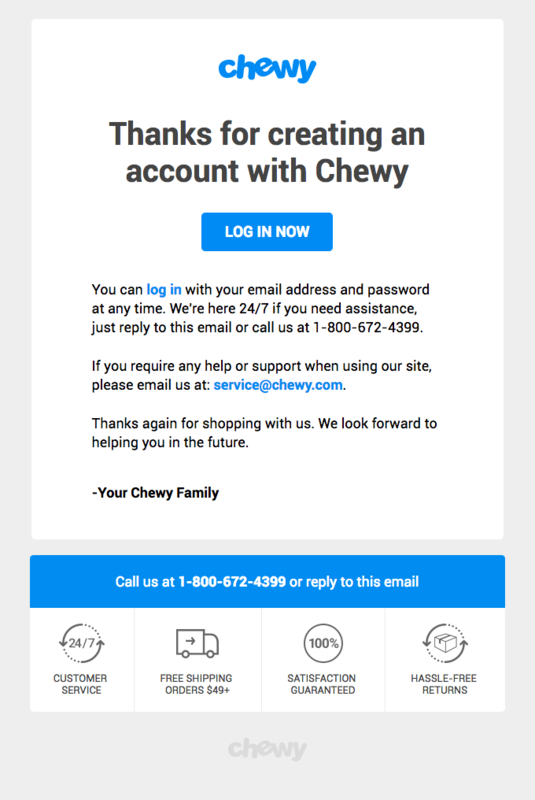 The “Login Now” button front and center quickly drives subscriber’s to Chewy’s site so they can start buying. 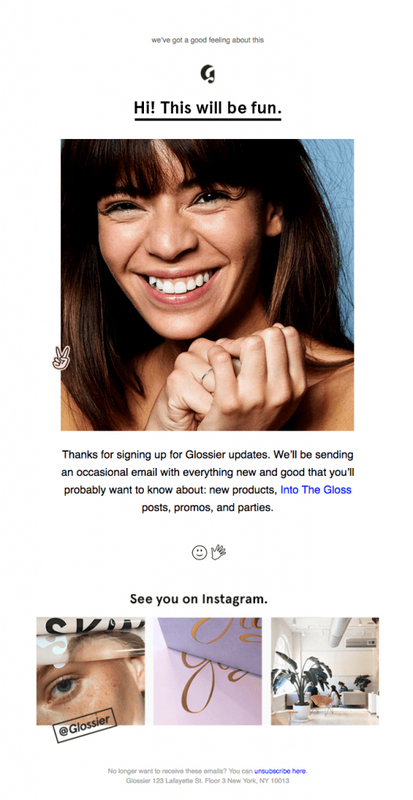 Glossier has a transparent, friendly look and feel to their emails that’s consistent across their marketing channels. As a purely e-commerce brand, a clean, user friendly, visually appealing aesthetic is necessary for its survival. 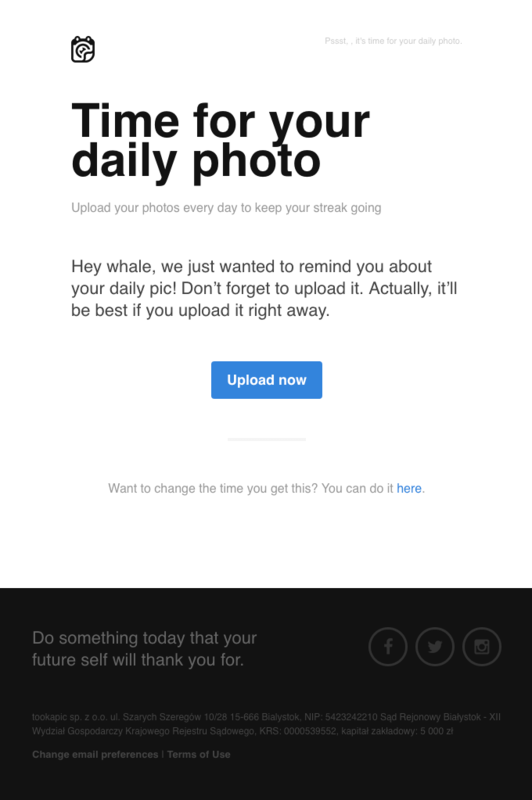 Also, notice how this email plays favorites with social media channels, saying “See you on Instagram”. 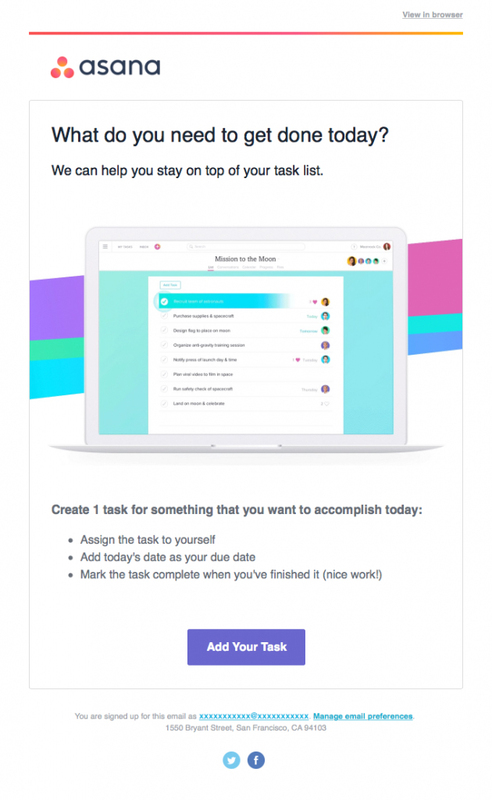 Any email marketer can agree that Asana is on the right track with its CTA: What do you need to get done today. Its subscribers most certainly will have an answer for that and will click the “Add Your Task” button to get started right away. 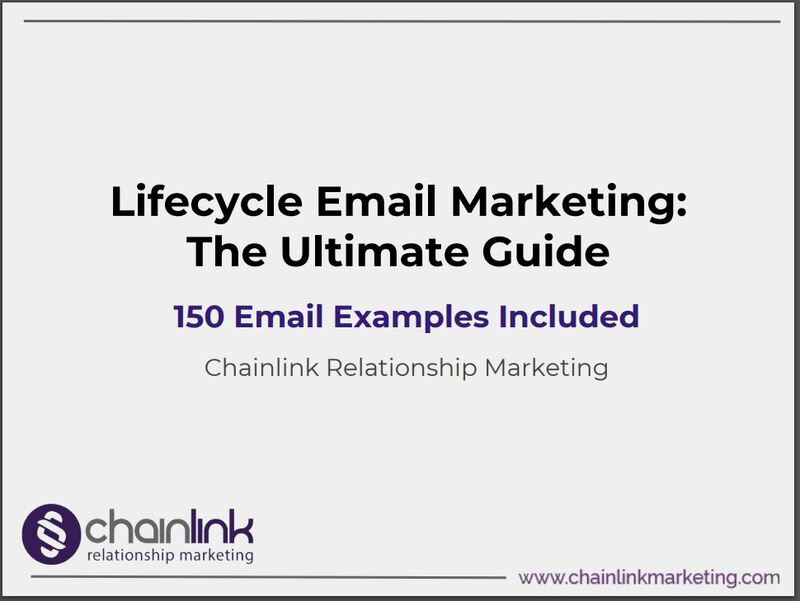 When it’s your last chance to convert subscribers into paying customers, you need to concise, direct and inviting. You want your last pitch to get straight to the point and make a lasting impression. Communication is key with end-of-trial emails. This email relays the necessary information about what changes if you decide not to pay. Its minimalist design serves this company well because it makes the green “Upgrade Now” button stand out. When people know that they’re going to lose something, it makes them pay attention. If they know their online stores will have an interrupted connection, chances are they will take action sooner than later. 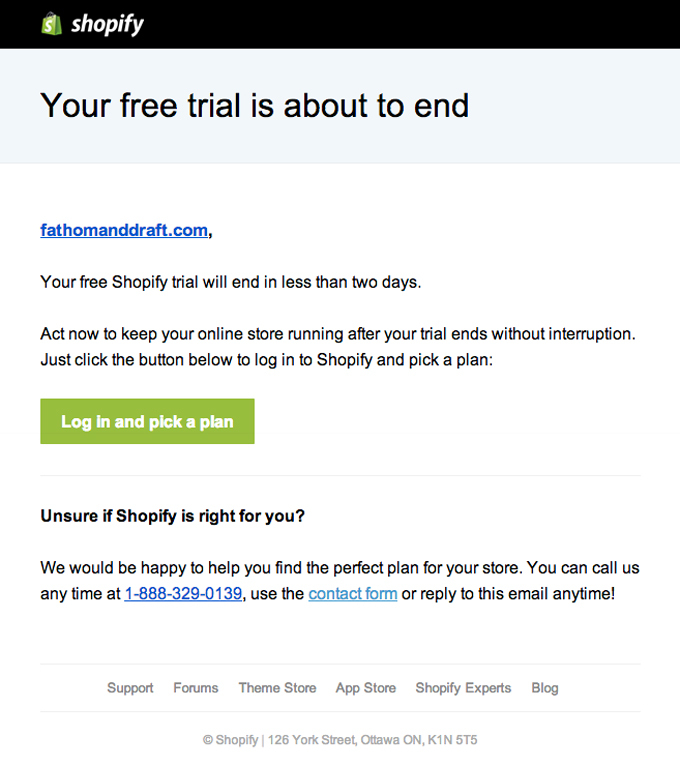 With another clearly visible green button, Shopify encourages subscribers to act immediately without sounding like they’re forcing anyone to do anything. 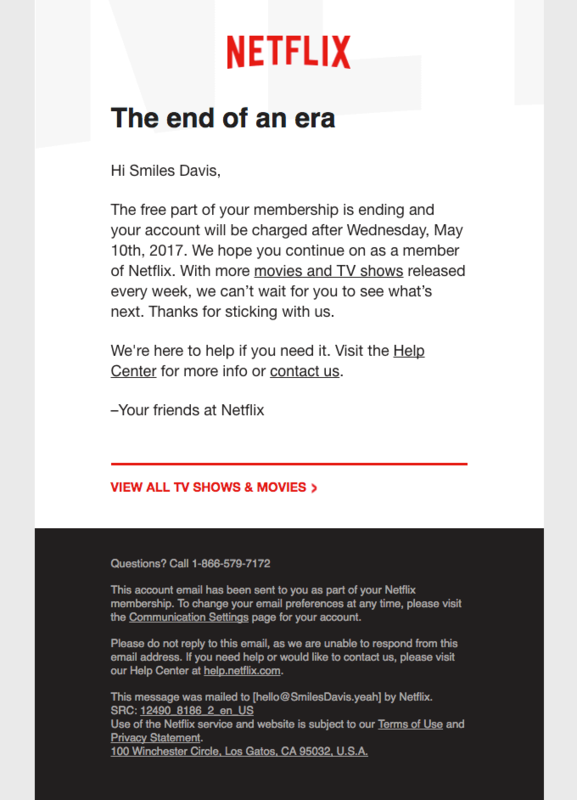 This email doesn’t need a CTA thanks to Netflix’s business model of automatically charging customers after their free trials end. By thanking you in advance for sticking with them, and signing off with “Your friends at Netflix”, you can tell that the media streaming empire doesn’t have too many issues making people stay. 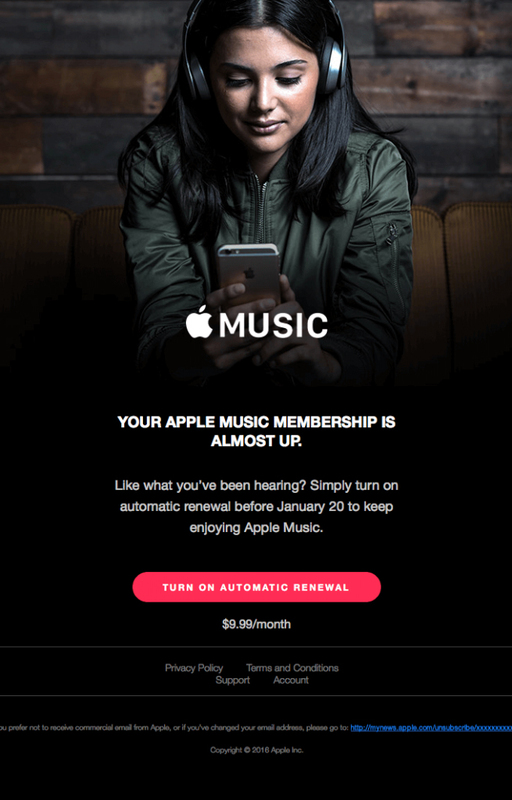 Apple succeeds at designing a sleek email with a clear, bold buttons to highlight the call to action: “Turn on Automatic Renewal”. The dark background makes the CTA pop even more. 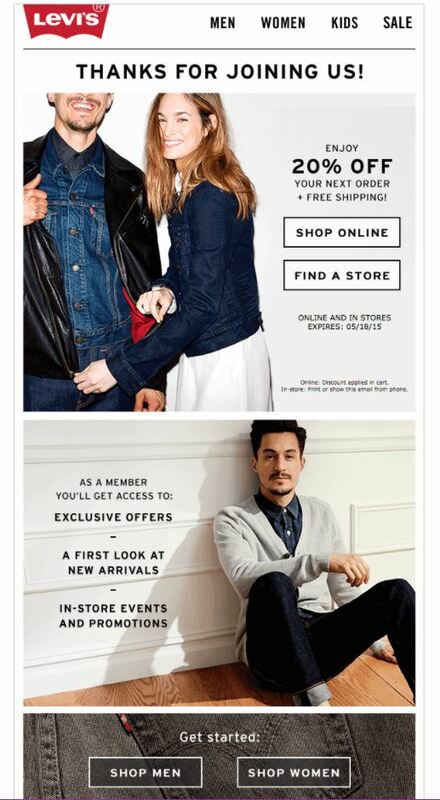 Activation emails are a mix between transactional and promotional. The activation process has to get completed either way, so you might as well use it as another way to reassure your customers and market your brand. 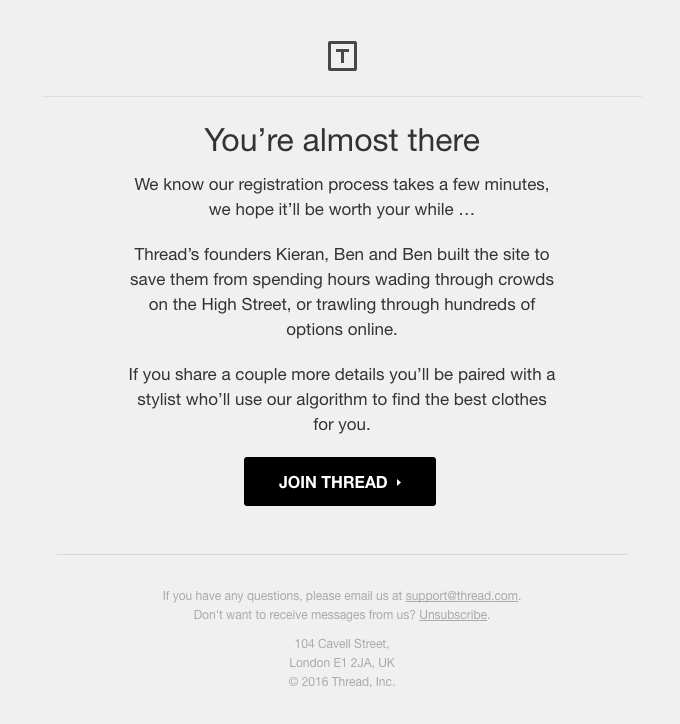 The honesty and sincerity in this email from Thread is perfect for an activation email. The company acknowledges that it takes a decent amount of time to register, but reminds subscribers of the benefits. 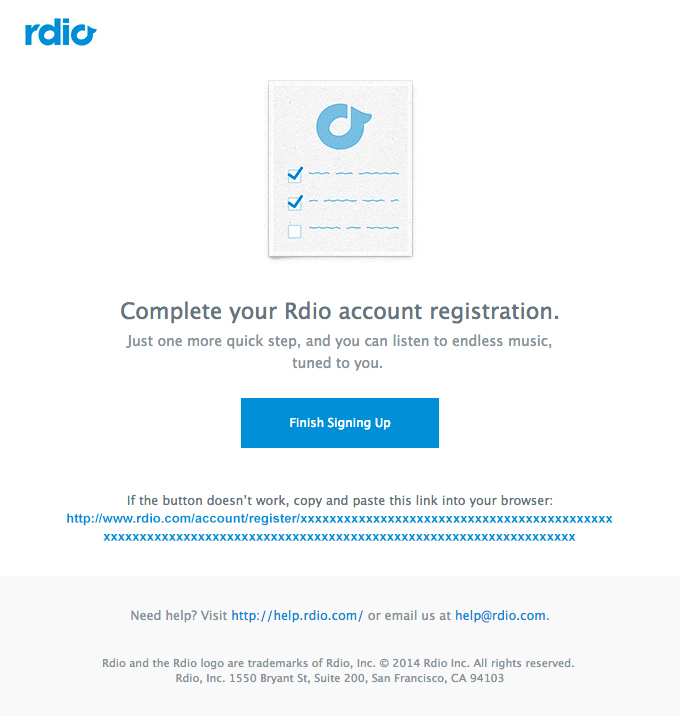 On the other hand, rdio emphasizes how quick it is to finish signing up to take advantage of their service. “Just one more quick step” is a great way for subscribers to activate fast. 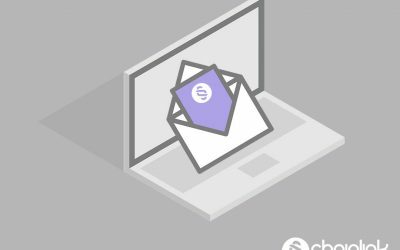 Activation emails require that subscribers take action, and sometimes less is more. 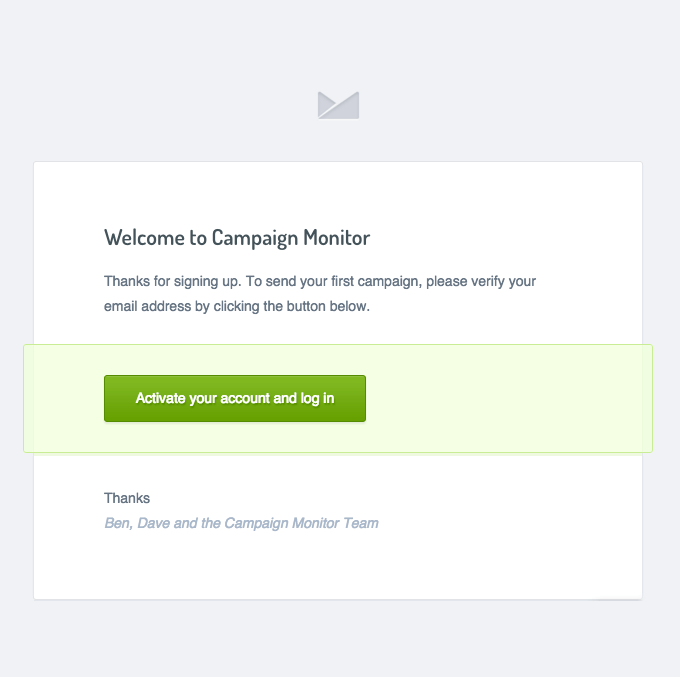 An extremely straightforward email without any bells or whistles like this one from Campaign Monitor ensures that the subscriber doesn’t get distracted and directly finishes the activation process. Convincing someone of why they should invest in your product or service needs to be done in a tactful way. Make the focus of your nudge email the benefits of your brand. It also can’t hurt to provide a few reasons why users should choose your company. “Last chance” is always an effective way to get a subscriber’s attention. 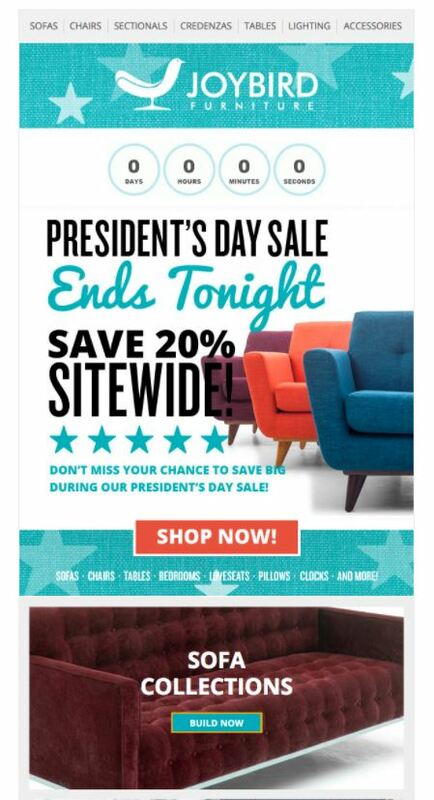 With the bright orange CTA’s to drive subscribers to Rifle’s website, this email excels by emphasizing the promotion’s time-sensitive nature. No one wants to miss out on a sale. This email uses human nature to its advantage by triggering subscribers’ fear of missing out. The countdown at the top of the email, emphasizing that “time is up”, pushes subscribers to act quickly. 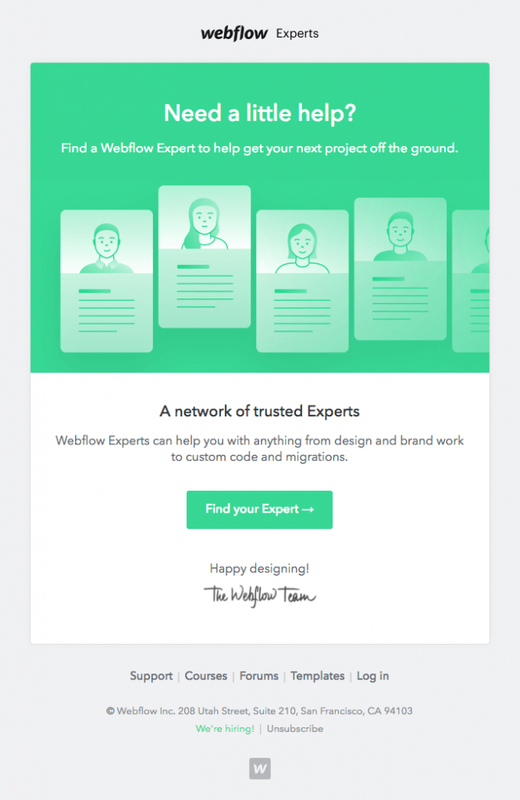 An email that offers help is another great approach to a nudge email. Someone who might have been inactive on your platform could realize they need to revisit your site for your services. This nudge email is unique in that it starts off as a typical reminder and then switches to a more urgent suggestion in the next sentence. The great part about this email is the fact that it gives subscribers the option to change the time they receive the daily email as well. Any chance you have to give users control over their experiences, you should do it. Your goal is to prove that you are providing value with your upsell. So many upsells actually provide great additional value to clients/customers, and yet people still often assume you’re only trying to get more money out of them. Since this is a common assumption, it’s wise to be extra strategic about the way you frame your message. This upsell email does it all. It proposes the account upgrade in a polite way, thanks the user for having an account in the first place, reminds the user of the benefits of having an upgraded account. Using language such as “Shall we?” and “What do you say?” seems friendlier and makes the choice less pressured. The way Moo frames this upsell is on-point. The play on words “Round the corners. Get the edge” paired with bright colors and spacing is eye-catching. 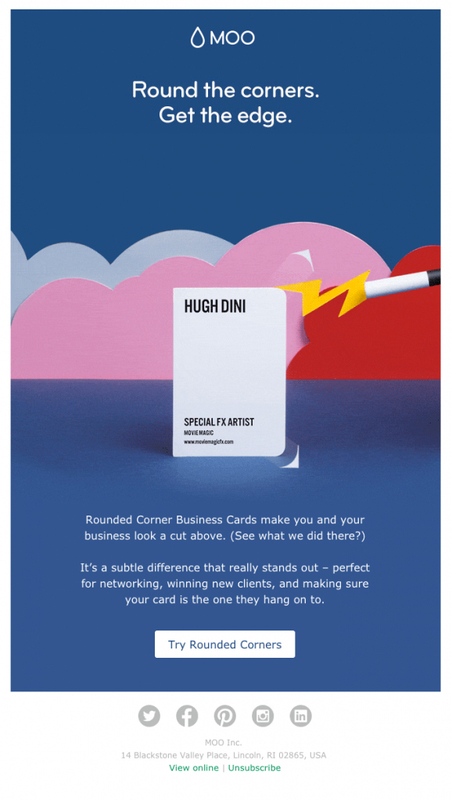 Keeping in mind that upgrading their business cards’ shape is probably not a priority for most people, they make a compelling argument for why it’s worth it.